Home Dairy Free Turtle Mountain Dairy Free Products Giveaway! Turtle Mountain Dairy Free Products Giveaway! UPDATE: The winner is Shannon [email protected] Congratulations! When I first found out I couldn’t have dairy, one of the things I missed most was ice cream. My husband went to the store and brought me home So Delicious Dairy Free ice cream. Truly, it tasted better than many regular ice creams. It had a smooth, silky, rich texture. It was delicious. Even those who can’t have dairy would like this! Turtle Mountain “provides consumers with healthier alternatives to dairy-based foods. All products are 100% plant based and contain no artificial sweeteners, trans-fats or hydrogenated oils, and most are made with certified organic ingredients.” Turtle Mountain products are sold under the name So Delicous and Purely Decadent. In addition to their soy ice cream products, Turtle Mountain has a line of coconut milk and ice cream products. For a twist on coffee creamer, Turtle Mountain suggests adding coconut creamer to your coffee for a unqiue taste. Turtle Mountain has generously offered to give away 4 free product coupons. You will then be able to buy any of the Turtle Mountain products of your choice. To enter this giveaway, simply go to Turtle Mountain’s website, choose which item you would like to try and then come back here leaving a comment to tell me which product. -Follow Mom’s Plans or let me know if you already are. -Follow Turtle Mountain on Facebook. -Follow Mom’s Plans on Facebook. -Follow Turtle Mountain on Twitter. -Follow Mom’s Plans on Twitter. -Blog about this giveaway or post it on Facebook or Twitter. This giveaway will end on November 10th. The winner will be chosen via random.org. Please make sure to leave your e-mail address so I can contact you. I received one free product coupon from Turtle Mountain for review purposes. (Thank you Turtle Mountain!) I received no other compensation for this giveaway. All opinions are my own. I most want to try the Banana Split Sandwiches! I’m a huge fan of So Delicious coconut milk ice cream! I would love to try their coconut milk kefir (now called “cultured coconut milk”). I’ve heard it’s a delicious non-dairy choice for healthy probiotics. I follow Turtle Mountain (So Delicious Dairy Free) on facebook! I would love to try to soy milk yogurt! I would love to try their Chocolate Peanut Butter Swirl Coconut Ice Cream. I already follow Turtle Mountain on Twitter. The soy milk ice cream sandwiches look great! My poor milk allergy son doesn’t get special frozen treats too often. They are pricey and not available at many stores. But whenever we get coupons I like to treat him! The sammies are something we’ve never had though. I follow mom’s plans on twitter! I follow So delicious (turtle mountain) on twitter! I like mom’s plans on facebook! I liked turtle mountain ( so delicious) on facebook! The Coconut Milk Beverage looks like it would make a great smoothie. Can’t wait to try it! I’d love to try the Vanilla Coconut Milk Yogurt. I would like to try the Organic Premium Soy Milk Quarts. So Delicious Non-Dairy Frozen Dessert, Organic, Chocolate Velvet sounds GREAT!! I would LOVE to try the Hazlenut Coconut Milk Creamer. I’d love to try the Chocolate Peanut Butter Swirl Purely Decadent. Thanks for the great giveaway! I follow Mom’s Plans via Google Friend Connect. I would so love to win. i’m lactose intolerant and have missed ice cream terribly. i’d love to try the chocolate obsession ice cream! I love the unsweetened coconut milk but I would love to try the Purely Decadent Cookie Dough ‘Ice Cream’! I’d like to try their yogurt… but I’d love to try their ice cream! I’d love to try their coconut milk vanilla bean ice cream! I like so delicious on facebook! The soy milk sandwiches sound great. Best of all these are my favorite and I really miss eating them. The brand sounds wonderful and I can not wait to try them. I’ve had their products and they are very good. 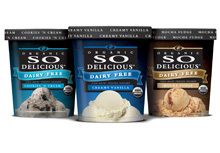 I like the SO Delicious and Purely Decadent soy ice cream products. Allergic to dairy protein so it’s nice to options! Thanks for the giveaway. Subscribed to your RSS feed, thanks! I would like to try the coconut milk! Would love to try the frozen coconut milk sandwhiches! I’d like to try the So Delicious Coconut Water Sorbet. I am a So Delicious Chocolate Velvet ice cream addict-not exaggerating I eat it almost everyday. I would like to try the Vanilla or Blueberry Agave sweetened yogurt. I want to try the Soy Milk Sandwiches & Stick. I Follow Turtle Mountain on Facebook. I Follow Mom’s Plans on Facebook. I Follow Turtle Mountain on Twitter. I Follow Mom’s Plans on Twitter. I’d most like to try the So Delicious Minis in Pomegranate! i would like to try their cultured soy milk yogurt! I would like to try the Purely Decadent Coconut Milk frozen dessert and also the Coconut Milk drinks. sounds totally boring, but I want the vanilla bean… I love plain vanilla with fruit mixed in! 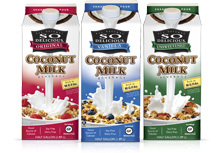 I would love to try their So Delicious® Coconut Milk Beverage. The Chocolate Velvet Soy Milk Quart is my item of choice! I’d like to try their Mango Rasberry bar! Thanks! I LOVE their products. I would buy coconut milk yogurt, kefir, ice cream and milk with the coupons. Vanilla bean coconut “ice cream”. I would like to try the coconut icecream for my family. My son is allergic to dairy so I think the Soy Milk Sandwiches & Stick Bars would be great for him. I just bought the Almond Coconut Minis today to try. I’m excited for dessert tomorrow! 🙂 Thanks so much for the giveaway! I’m following Mom’s Plans on GFC. i love the soo delicious coconut milk ice cream! The mini coconut milk sandwiches are a real treat in our house!! I’d love to try out the Chocolate Brownie Almond Frozen Desert. I follow your blog with GFC. I follow Turtle Mountain on twitter @Aerated. Thank you! My mom was telling me on the phone the other day about the coconut milk and how much she enjoyed it….so that’s what I would like to try. Or the coconut milk ice cream looks yummy. would like to try icecream sandwich! Follow Mom’s Plans on Facebook. I wanna try one of the Purely Decadants! Follow Turtle Mountain on Twitter. Follow Mom’s Plans on Twitter. Cultured Coconut Milk and the coconut sorbet are the items I’d like to try. I live in Brazil, and next month me and my family are going to spend our vacations at Walt Disney World, in Orlando – FL. My kids (with 2 and 3 years old) have food allergy to dairy and soy proteins, also with restrictions to lactose, soybeans oil and soy lecithin. I’m searching for products, such as rice milk, cookies, baby food and industrialized food, that are safe for my children. I would be very thankful if you could indicate to me a few brands, or products, that I can trust on them as dairy and soy free.